Episcopalian worship has been formally organised in Rosyth since 1917 (click here for more background), but the roots of our fellowship lie in the Anglican Church within the dockyard: click here for more about our history. Our church is dedicated to St Margaret, and there is more about her at this link. Rosyth, 3 miles south of Dunfermline, owes its existence to its role as a naval base for warships in the early 20th century, and in 2016 is celebrating its nominal centenary, with events throughout the year. Historically, the foreshore has been known as St Margaret’s Hope, the place where Queen Margaret landed in 1069. As the town was being planned from scratch, it was laid out as a “garden city” to house those employed at the dockyard and naval base. The naval base closed in 1996 and the only RN facility now remaining is HMS Caledonia, which provides support for stand-by naval personnel for ships undergoing refit in the former dockyard. This has been run by a commercial company since 1987, was bought by Babcock International in 1996, and now has a much reduced labour force. But Rosyth has not stood still. From the regeneration of the Naval Base area, Rosyth Europarc has developed into a business park providing warehousing and office accommodation for hi-tech manufacturing and major commercial concerns. The Port of Rosyth, established in 1997 by the Forth Port Authority, has developed considerably and provides an operating base for commercial work and a berth for cruise liners. Further clearance of the waterfront area has taken place by developers Scarborough Muir, and completion of the Queensferry Crossing in 2017 has greatly improved communications across the Forth. Just to the north, a wide variety of companies have premises on Carnegie Campus and the adjacent Pitreavie Business Park. Rosyth is now a thriving community with a population of about 13,000, over 60% of whom are of employable age. Good transport access to Edinburgh for daily commuters has resulted in recent extensive house-building programmes in the area. Today within Rosyth there are churches representing several different denominations and although all the churches have had fluctuations in their membership and congregational sizes, religion still plays an important part in the Rosyth community. Since 1997, we have shared, by invitation, the premises of Rosyth Methodist church and with whom we enjoy a successful Local Ecumenical Partnership. Click here for more about the partnership. Good relations exist between all the churches. The local clergy meet together as a Fraternity to discuss local issues, an ecumenical study group meets in the Parish Church most Monday evenings throughout the year, and members from all congregations join together in the Christmas Nativity event. Our own church is constantly used by community groups, we have a weekly coffee morning on Fridays (the ‘Triangle’ coffee shop), and lunches are served every Wednesday in the Parish Church Hall. However, the real challenge for all the churches is to make them welcoming and inviting to attract new worshippers of all ages from the steady influx of people to the area. 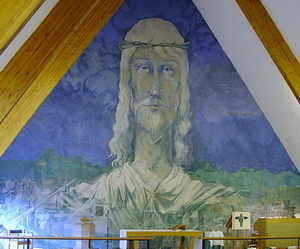 Christ is still alive in Rosyth, as the above mural in our church proclaims.